Coffee can take on the most delicious flavors … especially in the fall. There are so many wonderful seasonal coffees… pumpkin spice, hazelnut, vanilla spice, cinnamon, vanilla nutmeg… YUM! 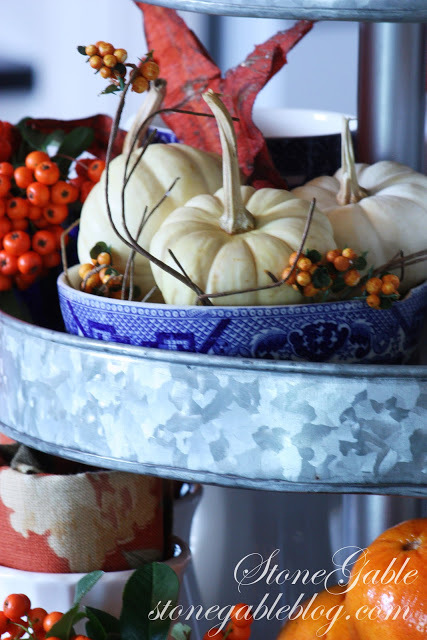 This Pottery Barn Outlet galvanized tiered tray is such a versatile piece! 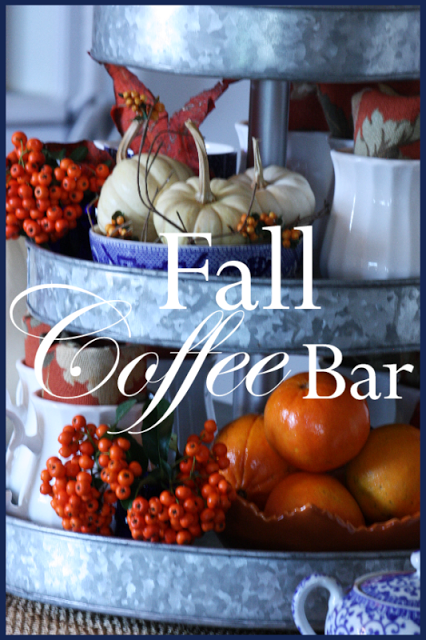 Today it works as a Fall coffee bar on my kitchen island! The Keurig coffee maker is on the opposite counter. A big white soup tureen holds lots of seasonal Kcups. White coffee mugs hold rolled napkins in rich autumnal colors. 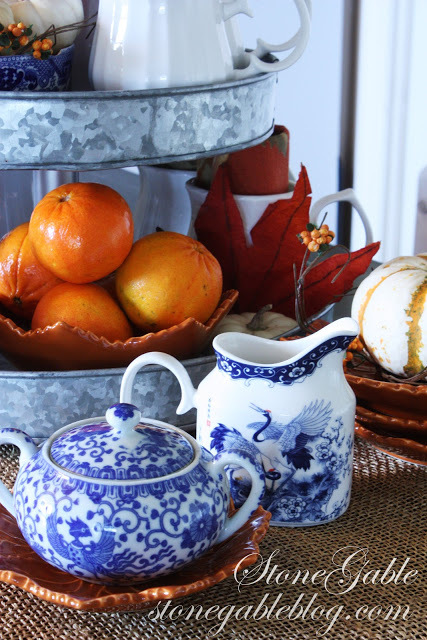 I love love love using oranges and blues together for fall… a little different… but I think they give fall a sophisticated look. Sugar bowl and creamer and little burnt orange leaf plates are ready to be used by guests. I would have shown some yummy pumpkin bread to go along with the coffee…. IF SOMEONE HAD NOT EATEN IT ALL! I’m so glad THE CULPRIT enjoyed it that much! A bowl of tangerines is offered for fruit lovers. 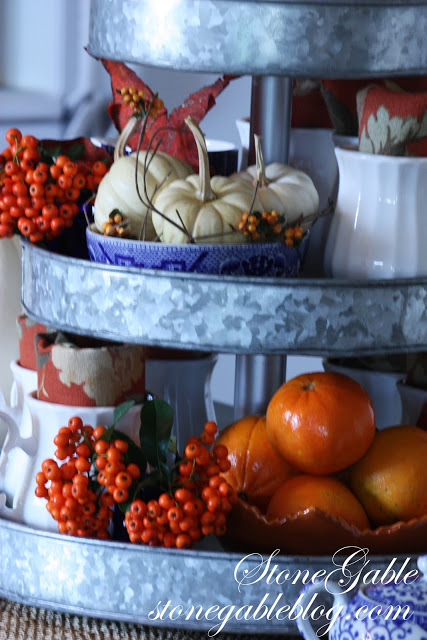 The top tier holds a little cobalt blue vase of pyracantha… some cinnamon sticks to stir coffee… little blue and white spice jars with nutmeg and cocoa…and vintage spoons. I tucked in a large egg cup filled with candy corn for a little fun treat! My boys go wild over candy corn. White pumpkins work well in this coffee bar. A barmbly candle ring under the pumpkins add a little “fluff”. Gotta have “fluff”! A small gathering of pumpkins and pyracantha sit next to the coffee station. I prepare everything the night before so when we wake up we can all have coffee and a little nosh to welcome the new day! Remember to pin this to your fall or decor Pinterest board. 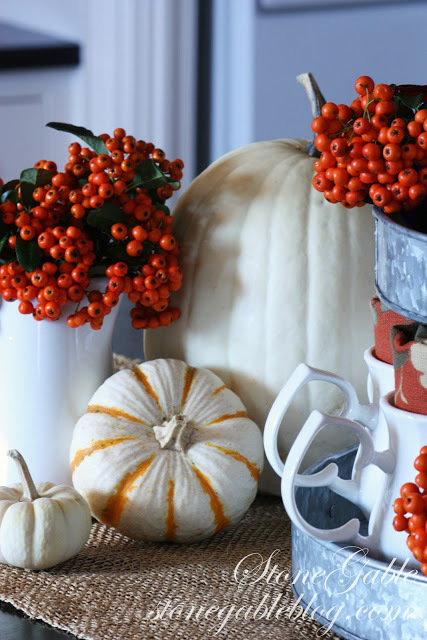 You can see this and more fall inspiration on my StoneGable FALL DECOR AND MORE board. Follow me HERE. I love your classy coffee bar! I’m looking for white mugs & am trying to find the ones you have pictured…..they are perfect!! Would you mind sharing the brand? I’ve searched everywhere I can think to look. Hi Michelle, I found these at HomeGoods several years ago. They have wonderful white dishware. This is an old post but I did not get my galvanized tier til maybe 18 mos ago(?). I get it out–put it away. Thank you for popping up old posts for this shows me ideas. For using that giant tier!! For now, it just got tucked away but this post will easily adapts to a Christmas theme too. Thank you! You have inspired me with your lovely coffee bar. 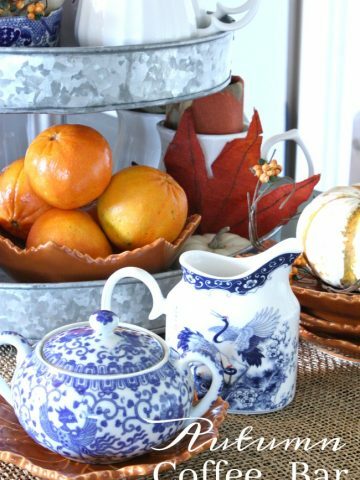 I think I need to get out my blue and white China to go along with my fall pumpkins and decore. I love to smell the different coffee scents when they are being brewed. So many to choose from ! Love the coffee bar for Fall! I’ve been planning mine in my head over the past day or so. Unfortunately, I’ve got to get to some of my faux berries/flowers in the garage. I, too, have a love of blue and white with the shades of orange. Thanks for another great coffee bar vignette. I love seeing your fall coffee bar. I need to make room for one in my kitchen. Love, love, love all the coffee bar ideas!! Thanks Yvonne. Again you outdid yourself. 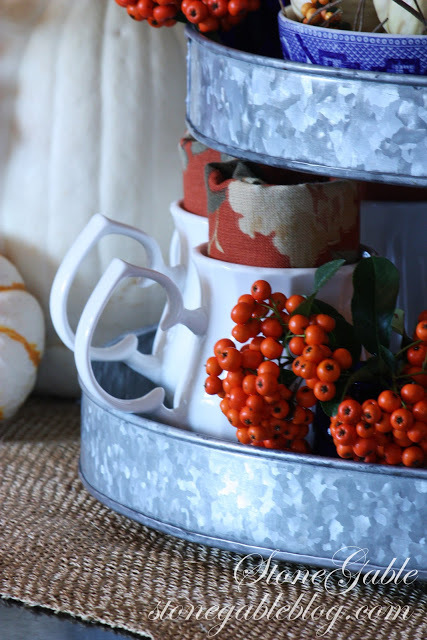 I love the idea of the galvanized tray with al the pop of color, and design. 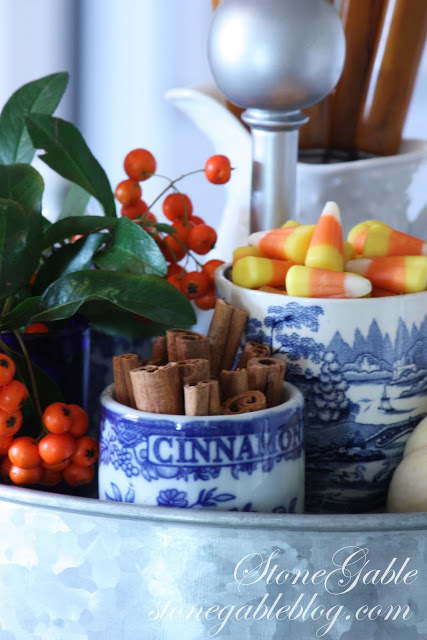 I see how you incorporated the blues and whites along with he orange and fall décor. It all fits in the puzzle. Look forward to your next blog, Thank you again. I’m glad you posted these older ideas for I had not noticed all the galvanized back then at Pottery Barn. I was getting dark iron things on their deeply discounted clearance sections for we had no outlets in So Cal then!! I just purchased my tiered stand for my Bunco hordourves time but then I got confused. How do I incorporated this huge ( yes I paid full price with birthday money) expensive accessory? I’m now encouraged for fall. I want to put it away until then. Thank you again! 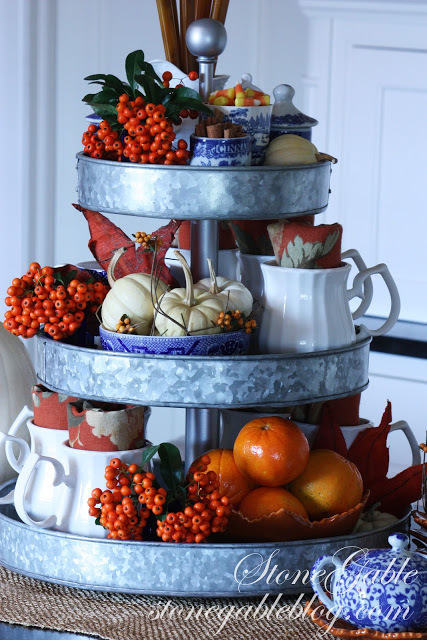 I purchased the three tier stand from PB….. Can’t wait to see how you will decorate it for Christmas. I just know you will! Lol! I think it is a wonderful piece to have and can see it being used on so many holidays. This fall display will take us through September, October, and November…. Then on to changing it out for Christmas! Love the PB three tier stand. I think I will order one as I can see it being used for lots of holidays! Loving your blog! I love that you have close up photos of all your beautiful projects. So many blogs have photos taken at such a distance that you can’t see the details. However, I would love to see some taken a few steps back to get the full effects in with the surroundings. Love your blog! Hello: what a beautiful eye you have! You have completely won me over to pairing blues with oranges, etc. and I have seldom used blue in my tablescapes or decor. (I’m a professional chef so I favor white, as I know you do too for food) So thank you, thank you, it’s always grand to discover new ways to add color to our lives. 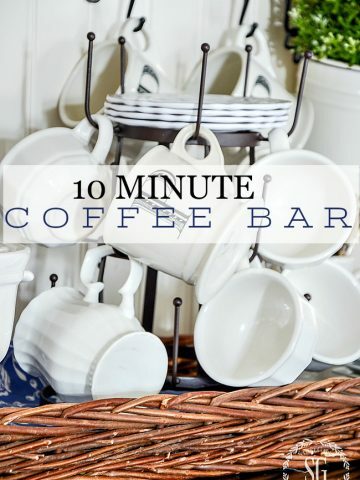 I covet your coffee bar, and I’m featuring it on my blog tomorrow. I hope you don’t mind! These posts have been on my reading list forever, and I think the way you decorate it for the seasons is adorable! First time visitor here. Enchanted. Pottery Barn should be paying you for advertising… oh my. I am sure many people — like me — will run tomorrow to PB and grab one of these too! Love the layering and the versatility of the piece. Have seen it there and loved it… but when YOU do what you DID…. drooling now. I always have the prettiest displays, Yvonne, that make your guests and family feel special and loved. Such an amazing grouping Yvonne and your pictures look amazing. We have a PB outlet about an hour away and I haven’t been yet…must go soon! Yvonne- be right over for a cup of tea!! This is wonderful. Featuring on my weekly wow’s Saturday. 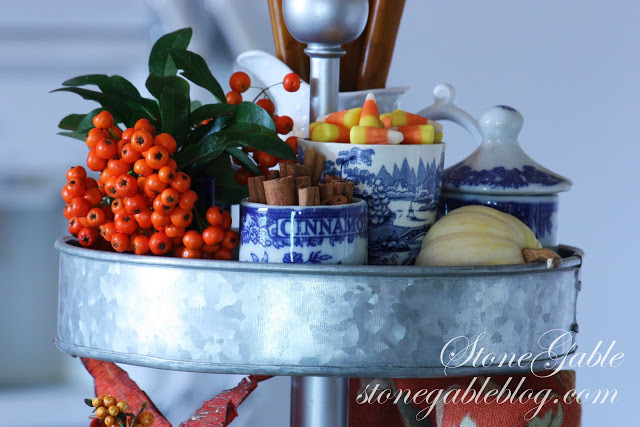 Fabulous tiered zinc tray…love the pyracantha berries with your blue and white pieces. I love your coffee bar! What a great idea to serve coffee and fixings so beautifully! You add such style and grace to the simplest of things. You’ve elevated coffee to an art form! It was this beautiful coffee bar in blue and white that first made we say I have to follow this blog…and it was and still is the beautiful images that keep me coming back again and again. Just a wonderful presentation and pretty way to drink coffee. Beautiful arrangement, Yvonne! My goodness, you are such an accomplished homemaker! I also love the colours blue and orange used together. I find the mixture very uplifting! This is such a pretty and festive way to serve coffee, Yvonne. 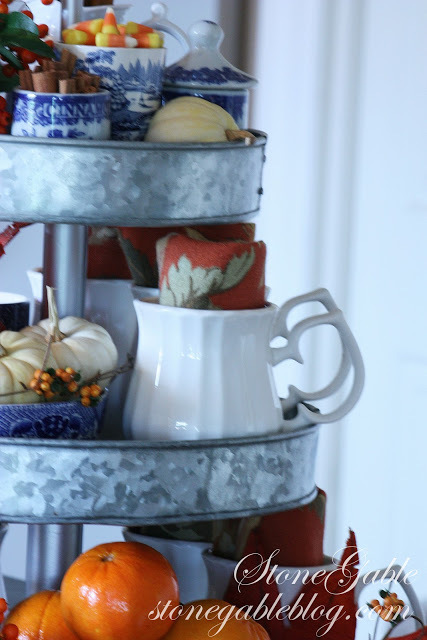 I love the galvanized tiered tray, and the pretty napkins rolled into the mugs–a great idea. I am imagining a little pumpkin spice stirred with a cinnamon stick. I will bring over some apple spice bread and join you for a cuppa. Love the coffee bar idea…and that must have been some Pumpkin Bread if there’s none left, dear friend!!! The blue and white combination with the orange is exquisite, indeed!!! 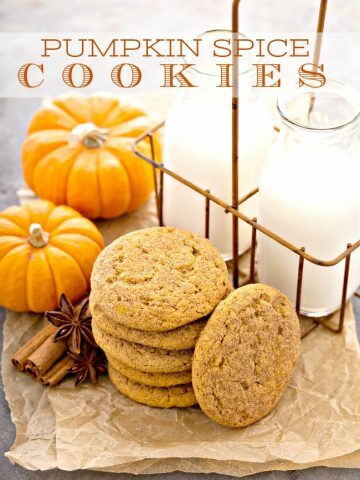 Now, had that been here On Crooked Creek…the candy corn AND the pumpkin bread would have been AOL!!! Ha! Creative idea for making guests (and family) fill right at home @ StoneGable!!! I love that tiered tray! You have it accessorized so beautifully too. It’s decorative, it’s functional…it’s a perfect piece. I am so glad to see you posting. This must mean that you did not lose your power to Sandy and that all is well in your neighborhood. I have never been an orange fan but have just changed my mind. It looks glorious with your blue and white. Great inspiration, as always. Hi there, Oh what a lovely arrangement of cups, creamer, tangerines etc. you have put together. I especially love the Pyracantha berries-they are so pretty; I did want to check a fact I grew up hearing-just in case…my mother always told me the berries are poisonous(we had a large bush in our yard). I don’t know whether she told me that to scare me or if it is true; I do know birds get very drunk on them and will fly into homes and windows. I do love your color combinations and would love to have coffee at your home. Hi Nana, Pyracantha berries are not poisonous, but they are very bitter. Just wanted to clear that up! This is very sweet and rivals the coffee bars I have seen at B&B’s! Love the galvanized piece and the blue is a perfect complimentary color! Well done, Yvonne! Oh my gosh you amaze me. :o) This is so welcoming and lovely. I think I’m doing my Thanksgiving table in blues, golds and orange. I won’t have a crowd so it will be easier to spend time on the fun things! The linky party button looks pretty good doesn’t it? Looking forward to partying with you. Enjoy the rest of your week! beautiful and useful! I love your coffee bar!!! I love your galvanized piece. Such a great way to create a coffee bar! Extra touches like this are what I love to do for people who visit our home. So beautiful! What a great idea. I love the galvanized tray! Yvonne, this is precious. Love it. I hope you and yours are all safe from the storms. I tried to post to you ,but sometimes your blog knocks out my posts. Not sure why. Yvonne, your coffee bar is beautiful! What a lovely way to keep things accessible for everyone. I love your idea of keeping the Kcups in a soup tureen. I may need to “borrow” that idea! I love it! You have the most creative hospitality ideas! This looks so beautiful. And you used two of my favourite fall colours – cobalt blue and orange. This could be done for any season when entertaining. Have a great day! GREAT idea, very cleverly put together – and WOWZA photos, you sure do have the touch, girlfriend. So fall and so pretty. Oh that wee crock of cinnamon has captured my heart! Is it an antique? Oh darling Ivonne, I’m such a fan of your three tier, it just makes me swoon everytime I see it!! Is it tin, or galvanized?? 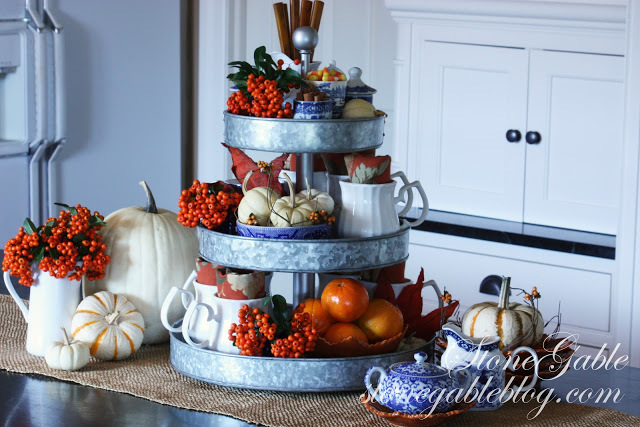 I am going to copy it from a tin shop I’ve seen around here, it it awesome and I love the way you arranged it for fall, wow!! So unique! I also love coffee and your fall bar is gorgeous, I have my machine just where I can see it, but no bar, perse. Loved this post. Big hugs sweetie. 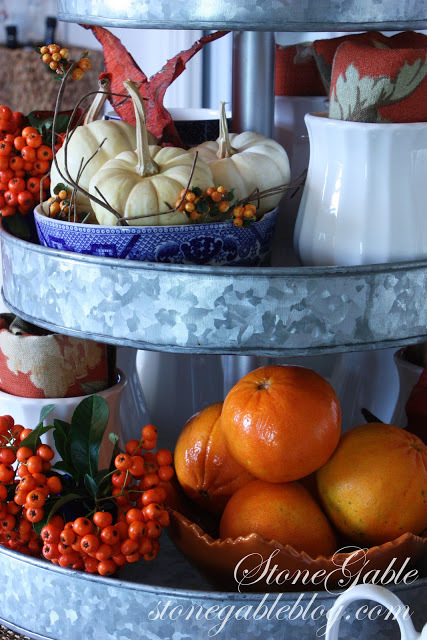 Your coffee bar is so festive and fun! What wonderful ideas for dressing it up! My daughter wants a coffee bar at her wedding in December, so these are some good ideas to get me started. I have a hot beverage station in my kitchen with hot tea and hot chocolate as well as coffee. It’s something for all of our palates. I might have to dress ours up a little before we have company next weekend! This looks wonderful! You put me in the mood for a cup of coffee – I will have to brew some! Lovely photos….My mother just bought the galvanized three tier stand and loves it!